Japan’s rising public debt has implications that go beyond its economy. The magnitude of Japan’s sovereign debt is an anomaly, and the subject of a great deal of debate in recent years. After all, few issues have attracted as much global attention lately as national debt. With many advanced economies possessing a public debt-to-GDP ratio hovering between 75 percent and 110 percent, how solid can Japan’s economic foundations be with its public debt north of 240 percent of GDP? On the face of it, this seems all the more worrying given that Greece, which required two bailout packages to keep from collapsing during the euro crisis, is the country with the next highest debt-to-GDP ratio at 152.5 percent. While certain factors have prevented Japan’s growing debt from wreaking immediate havoc, there are important connections to the greater security and stability of Japan that should encourage a more robust response from its government. National debt if often cited in international finger pointing, in which it is frequently misconstrued as defining a nation’s immediate solvency and its fiscal responsibility. While these perceptions can have a powerful domestic political effect, the real risk of a nation’s sovereign debt depends on underlying factors that must be examined in context. In Japan, for example, has a yield on Japanese government bonds is stable at near zero. One might reasonably have expected the yield to increase to compensate holders of the bonds for the greater risk presumably associated with the larger debt burden, but this has not been the case. In fact, confidence levels remain relatively high. One reason Japan’s sovereign debt hasn’t toppled its economy has been that much of it is held by domestic investors. High domestic savings, coupled with a relatively strong tendency towards domestic investment (known as home bias) has cushioned Japan against risks from fluctuations in currency markets. This is not, however, an infallible equilibrium. Overseas investors flocked to Japanese bonds in the wake of the euro crisis and then subsequently dumped them as the yen depreciated over the past year and a half. In fact, rising national debt and deficits are not necessarily problematic in themselves. Countries responding to market shocks and emerging economies may run up deficits and public debt from influxes of foreign direct investment and government spending on public works. Also, like personal debt, sovereign debt is not likely to be owed all at the same time. Still, Japan’s debt will eventually present problems if its growth continues unabated. Runaway national debt could trigger destabilizing economic consequences, such as rapid inflation, and could also creep into other areas of national sustainability. As it stands, Japan’s existing debt carries with it significant long-term risk and negative implications for multiple aspects of Japan’s national security. First, uncertainty drives risk perception. Expectations, predictability and control, on the other hand, are methods policymakers employ to promote and maintain stability. Japan’s debt-to-GDP ratio is already a historical outlier, even in an era of expanding sovereign debt. Among the only other comparable examples are France after the First World War and Israel during the 1970s and 1980s, and these debt levels were driven, in part, by war. Both France and Israel were able to wrestle their crises under control within a decade through economic reform and confidence building measures. Japan, on the other hand, is nursing two decades of rapid debt expansion and is on track to surpass Israel’s unfortunate historical debt record. At the peak of Israel’s debt crisis it was on the verge of repudiation, and although Japan’s current economy is surely in better shape to confront its liabilities than Israel’s was after the Yom Kippur War and 1983 crisis, an important takeaway should be that the two examples most similar to Japan’s current debt stature led their respective countries to the brink of economic collapse. Crossing that threshold removes all historical precedent from which to compare – at least among advanced economies. A movement into unknown territory means further uncertainty, potentially eroding fiscal confidence. This destabilization could possibly feed into runaway debt and inflation, which could be catastrophic to the Japanese economy. Second, any catastrophe that befell Japan, the world’s third-largest economy would certainly have severe global ramifications, including the potential for irreparable harm to its economic soft power. Third, an erosion of economic power directly translates into a loss of international political power – particularly for Japan. During Japan’s rapid economic expansion following its postwar reconstruction, Japanese foreign policy strategy was centered on building and exploiting its economic power while relying on the U.S.-Japan Alliance for traditional security support; a pragmatic evolution of the Yoshida Doctrine. Consider the implications of Japan being the second largest contributor to many international organizations: U.N. Peacekeeping Operations (10.83 percent), the IMF (6.461 percent quota shares and 6.135 percent voting shares), and the World Bank (8.57 percent of total, 8.13 percent voting power) to name a few. Monetary contributions determine to a significant degree the influence a country has over the policies of these organizations. Japan is also the fifth largest distributer of international aid (OECD). Meanwhile, the government of Shinzo Abe is pushing to revise the Charter of Japan’s Official Development Assistance (ODA) to allow the use of Japanese aid in distributing military assistance to foreign nations. However, since Japan’s economic crisis in the early 1990s its ODA disbursements have been following a slightly negative average trend. This is in contrast to the other top four contributing countries: the U.S., Germany, U.K., and France, which have seen a sustained period of overall ODA growth. These examples are not just critical for purely economic reasons. There are far-reaching implications for other areas of security that rely on a strong economic foundation. Assistance given to regional neighbors and allies, for example, is directly linked to Japanese interests in maintaining regional stability and security. Japan also certainly has an interest in promoting domestic order in countries that have a significant Japanese business presence and large populations of Japanese expatriates. A perceived loss of economic confidence and relevancy from Japan’s international peers can also directly undermine diplomatic leverage in international politics vis-à-vis rival economic powers, frustrating foreign policy objectives. This aspect of Japan’s national power base, developed during Japan’s economic heyday, has been decaying over the past twenty years. Japan’s two “lost decades” dragged its economy into perpetual stagnation. Meanwhile, China’s rapid economic growth has relegated Japan to third place among the world’s largest economies. Sustained increases in sovereign debt only limits Japan’s capacity to undertake various power-building endeavors. Although Abe’s effort to “normalize” Japan through constitutional revisions may have merit, economic influence is a powerful diplomatic tool that should be complementary to other national security apparatuses, not consigned to a secondary position. Finally, domestic social and political opportunity costs are real. Money spent on one budgetary item is money unavailable for others. As Japan’s national debt growth continues to outpace overall economic growth, the cost of servicing the debt could create fiscal constraints that limit the ability to create and execute policy. For defense expenditures, for example, despite Abe’s increase of the defense budget last year, Japan has long maintained a defense spending rate hovering at (or slightly below) 1 percent of GDP (SIPRI Database), a self-imposed limitation that has historically enjoyed widespread support among the Japanese populace. Already a highly sensitive national issue, if the debt issue reaches a flashpoint, one of the first demands on the government will be to reign defense spending back in – regardless of what China is doing in the East China Sea. Over the years, successive Japanese administrations have made ineffectual attempts to correct the country’s economic woes. The Abe government has been refreshingly comprehensive in its economic initiatives, known as Abenomics. The program consists of three “arrows”: (1) aggressive monetary policy; (2) expansionary fiscal policy; and (3) structural reforms. Confidence levels remain cautiously optimistic as the first two arrows have been let fly and appear to be achieving their desired results. It is the third arrow, however, that will make or break Abe’s economic legacy. 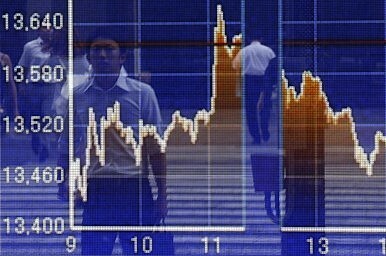 The economic growth promised by the third arrow’s reforms and growth strategies are critical for Japan. The proposed corporate tax cut is but a drop in the bucket, and Japan’s commitment to the Trans-Pacific Partnership is far from secured. One revenue-generating policy increased the consumption tax to 8 percent in April, with an additional hike to 10 percent slated for 2015. So far, all this has netted Abe is increasing flak from the increase in the cost of living. Any increase in tax revenue will have little impact on the sovereign debt if economic growth contracts; Japan needs significant long-term economic expansion. Abe and his administration must follow through on their promises of substantial structural reform. While it is possible that Japan’s economy could continue running debts and deficits for decades to come, the inevitable result will be a slow and sad degeneration of what was once a highly competitive and vibrant economy – at one time expected to challenge the United States. Japan’s sovereign debt may not collapse on itself anytime soon, but left unchecked, it will continue to gnaw away at other important aspects of Japan’s national power and stability. From this vantage point, economic and political risks are worth taking for meaningful reform. In fact, despite the unpopularity of some recent policies (such as collective-self defense and the consumption tax increase), a growing desire among the Japanese public for visionary risk taking and a departure from business-as-usual politics is likely why Abenomics initially earned relatively high approval ratings for Abe’s administration. It was an uncommonly good start for a Japanese prime minister but economic growth and the resultant containment of the public debt must remain Abe’s first priority. The alternative, resignation to the status-quo, will only further undermine critical aspects of Japan’s national security and global interests. Andrew Windsor is an international political and business consultant based in Washington D.C.